This site presents wall upholstery products for professionals like drapery workrooms or upholstery businesses. CleanEdgeSystem.com™ sells specialized tracks and tools to use in the installation of fabric walls. The tracks are easy to handle and perform incredibly well in all situation in a home. Some of you are not familiar with our fabric system yet. Do keep reading and you will find everything you need right here. Now, if you are interested in a track like CES or Big Boy, ask us for samples. Fill up the form. Do you still need help, never hesitate to contact us? The common factor of the images or videos presented is fabric installation made in homes. Among the most popular upholstered rooms, the list of spaces includes bedrooms, powder rooms, dining rooms, corridors or libraries. Still, all rooms can receive fabric on the walls. So why is it so popular in homes? The reason is that this revolutionary track works with complex features found in a room; look at the image below. Would you be able to install a standard track around these pilasters? I don’t think so! The fact is CES track is the solution around the fanciest moldings or millwork, real and faux wood beams too. 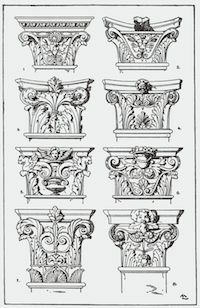 You can do pilaster like this one. Also, CES fits very nicely on arch doors. What makes this track perform so well? An important feature is its size. Yes, CES is slim as a quarter inch, easily cut and placed against moldings. 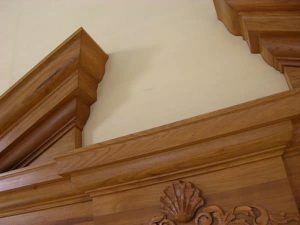 For example, below is an image of a deep molding on a mantel, and the fabric is a pale yellow on the wall. Would you like to learn more, check out the track’s details? In fact, once the fabric is on the wall, you will not add any decorative trimmings. For this reason, we call this installation clean edge wall upholstery. Tools for a clean edge finish. To complete the job, we have professional upholstery tools for working with the tracks too. They perform extremely well on a job. The 5 stars hand tool is our track cutter and of course a few special spatulas. Remember your hand-tools or get a Deluxe kit which includes 5 pieces. Last items are the compensation plates. They fit around electrical outlets and wall sconces. Check them out the compensation switch plate. Now, for installers who prefer keeping an installation traditional, there is a very interesting new simple slat. Of course, this method has the fabric stapled to the slat. The result is a welt or braid is added for hiding staples. Over that flat braid, you can also add decorative nails. They do not split the track. Why don’t you visit the Contour Wall System page? We have much information on upholstery products. Do browse through each page.